Me VS. The Sugar...: The Sugar vs. My Allergies! 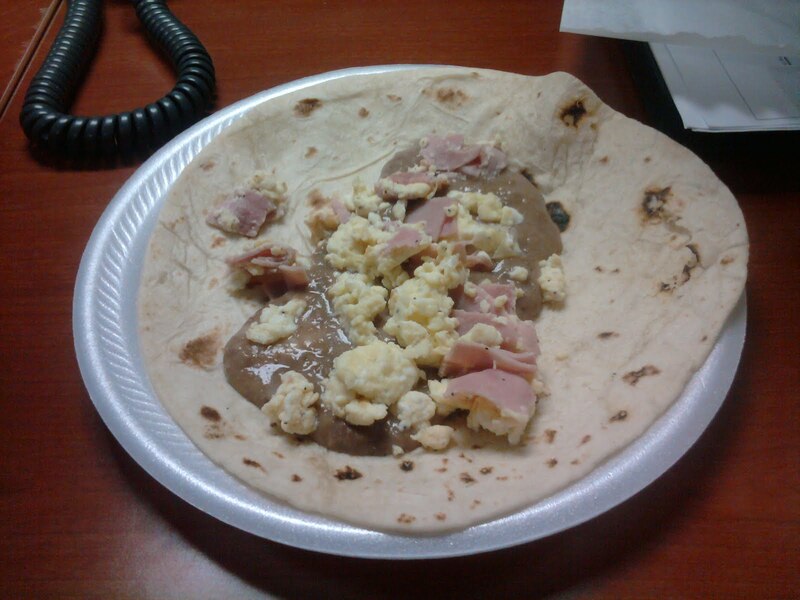 Here is my pre-workout breakfast snack. 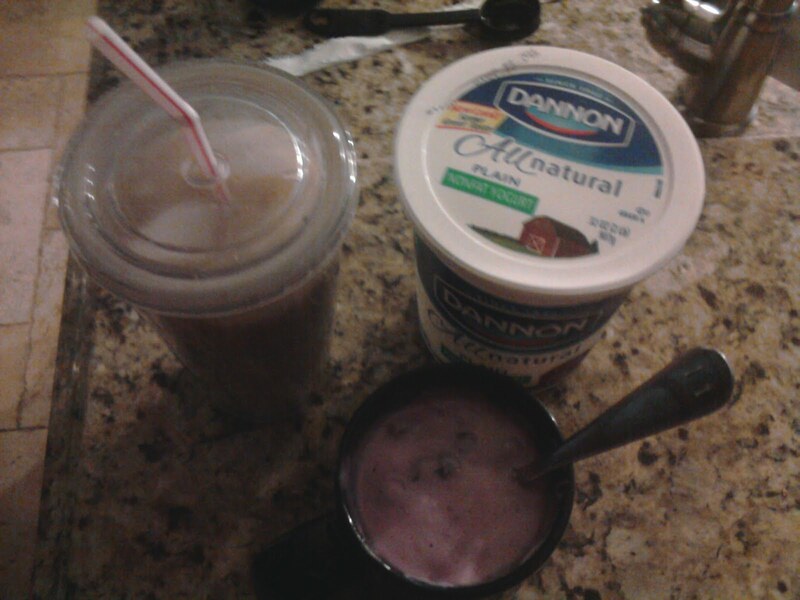 I buy the frozen blueberries and nuke them for 1 minute, then mix them with my yogurt. It provides just the right amount of sweetness, cause after all, it's always me against The Sugar! I had a good workout this morning, me and my baby belly went swimming. The water was nice too. I usually hate getting into a cold pool, but with the summer heat and my internal baby heater, that cold water doesn't feel too bad. I'm a slow swimmer, but believe it or not, I used to be slower. Stretching my feet, by sitting on my knees has really helped me get a little bit faster. Any improvement is good for me, though. I swam my 3 warm up laps, then did 10 regular laps, then I did 10 laps of drills. At work, we have a Wednesday pot-luck breakfast thing going. It's always a toss up so I always bring my oatmeal in case my only options are pastries. Today, the college kids made us a yummy breakfast and I got first dibs. Pregnancy, after all, does have it's perks! I also had some coffee with creamer, and you guessed it, no sugar! 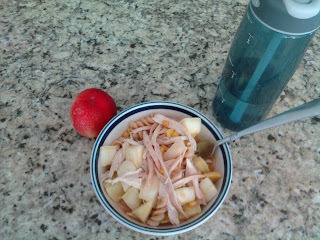 For lunch, leftovers galore! 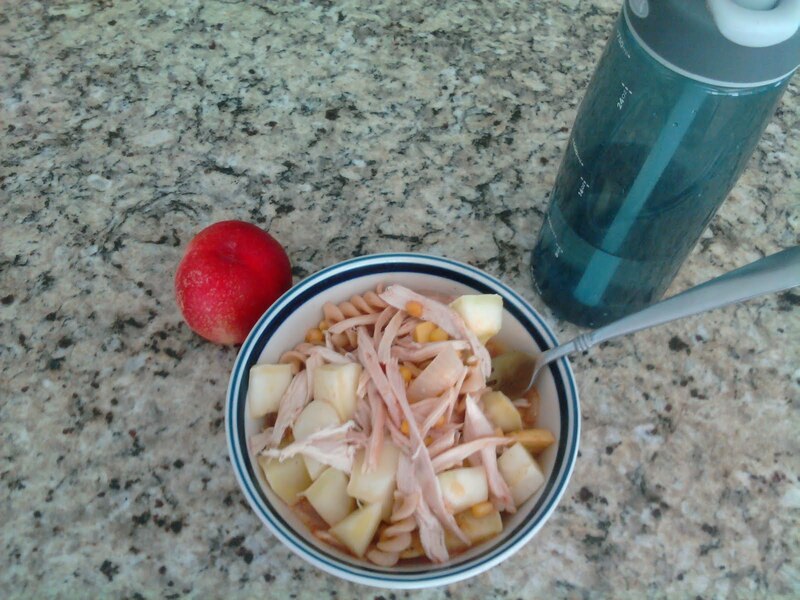 I combined the leftover calabacitas with some whole wheat pasta and chicken to make myself some healthy chicken soup! It was good and I' was recharged and ready to do some damage at work :) Such is the life of programmer! 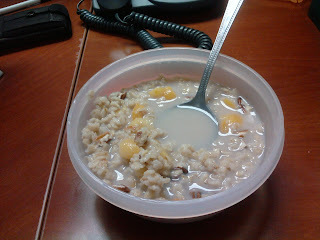 Since I didn't have this yummy treat for breakfast, I got to have it for my snack instead. With the dried apricots, I didn't even need to add any sugar. I did add 1 teaspoon of honey, though, but this is an improvement because I used to add a spoonful to help with my allergies, or so I told myself. You see, the pregnancy caused me to get my first dose of allergies - ever! My eyes would just start itching and watering, to the point where I had to pull over a couple of times as I was driving to wait out the attack. These attacks were so bad that I couldn't even keep one eye open. I didn't really want to take anything for the allergies, but I did hear somewhere (maybe on John Tesh?) that having a tablespoon of local honey a day could help ward off the allergies. So I tried it, and the attacks went down, and that prompted me to add honey to everything I ate or drank. After all, it was helping me with allergies. Ahh, that sneaky, sneaky Sugar did it again! It found a way to creep back into my life without any moderation. I ain't giving up that easily though, so now I'm adding it sparingly to my oatmeal and I keep telling myself it doesn't need to be in my yogurt or tea! After work, I had to pick up my prescription from Walgreen's, and was presently surprised to find no cars in the drive-thru. However, they had run out of my prescription so I only got 5 vitamins to hold me over until their next shipment. Now I have to go back! When I got home, I had a decision to make basmatti rice vs. brown rice. I opted to go with the basmatti rice because I didn't want to wait the extra 20 minutes for it to cook. The Sugar struck again! Did it really though, is basmatti rice that bad? If there are any registered dietitians out there please chime in. Or maybe I'll have to do some more research on it later. The rest of the dinner was good, though. It was a stir-fry of frozen veggies with shrimp and leftover chicken. 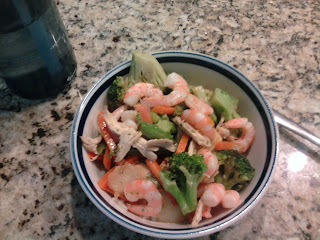 I really just added some smart balance, salt & pepper and voila - dinner was served. 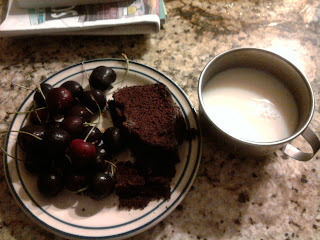 For desert, I had a cup of cherries, milk and some of that yummy farmer's market chocolate chip bread. Oh too good! None to report today, but I'm going to keep on trying! It was a good day, but I was a little sore from yesterday's weight session. We also went walking with the doggies after dinner. Walking is getting so much harder and I have no clue how people that have twins are able to manage. I have a new found respect for those mommies!